Finally! 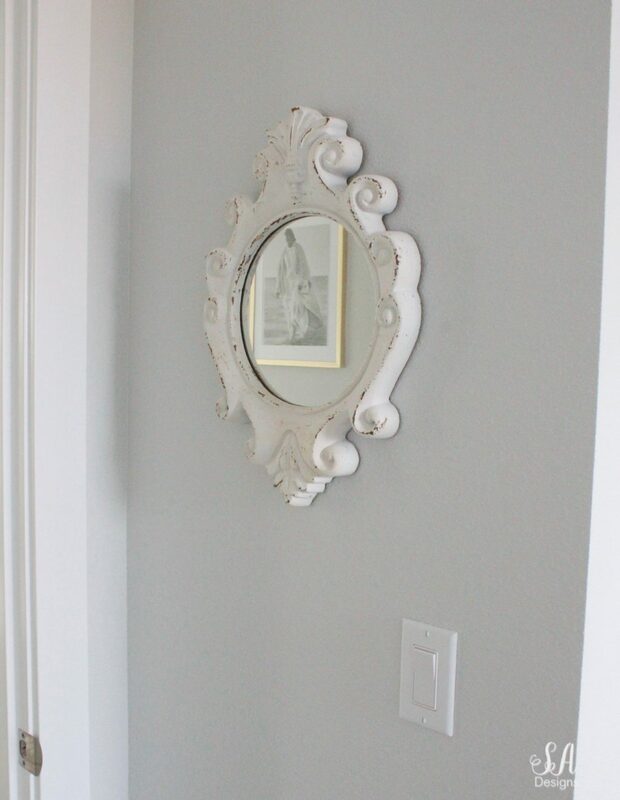 We’ve been in this home for 9 months and decided what we wanted to do in the guest bedroom and today we’re sharing the result with you. 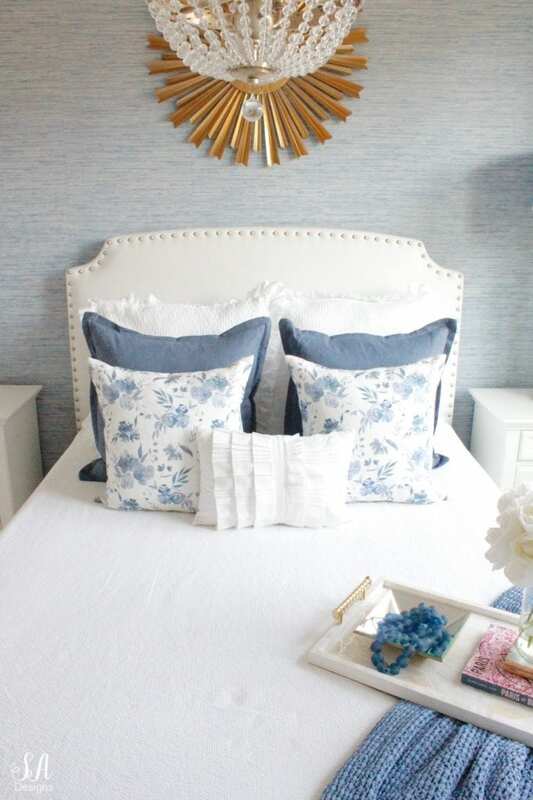 I’m so glad you could join me today for our coastal glam guest bedroom reveal! I had originally decided to do some kind of wallpaper mural on this back wall, behind the headboard, but when it arrived it just didn’t feel right. For months we tried looking at it, hoping it would become what I had envisioned but it just wasn’t happening. Fun idea, but my gut told me, “Not for this room”. And that’s okay! Listen to that and go with it! 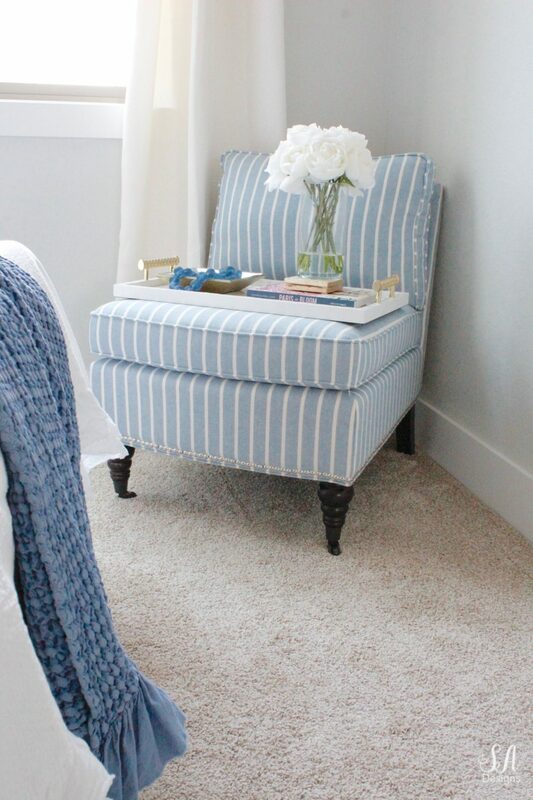 I came across this gorgeous Ocean Blue Faux Grasscloth Wallpaper on D. Marie Interiors and immediately fell in love. This was the wallpaper! It’s “sky” color was such a pretty medium blue, with lighter and darker tones throughout the design as well. I knew it was going to allow me endless possibilities and fun combinations in this space. In just a few hours, my friend and I had it up. It was our first time but it went well! Check out her site for other beautiful wallpapers! 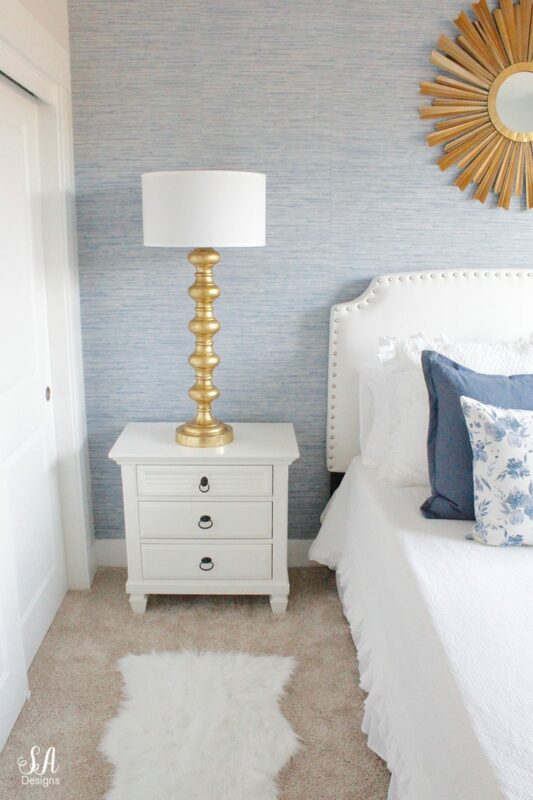 These pretty white nightstands were such a good price and the perfect size for this small little guest bedroom. I found these to-die-for gold leaf turned table lamps on Perigold’s website and, since I’m a Perigold Tastemaker, they sent them to me for this space. 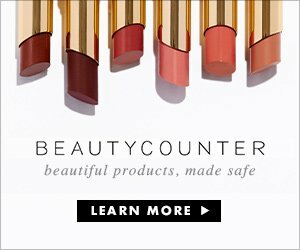 They have since sold out (quickly) but they have so many other gorgeous options HERE! 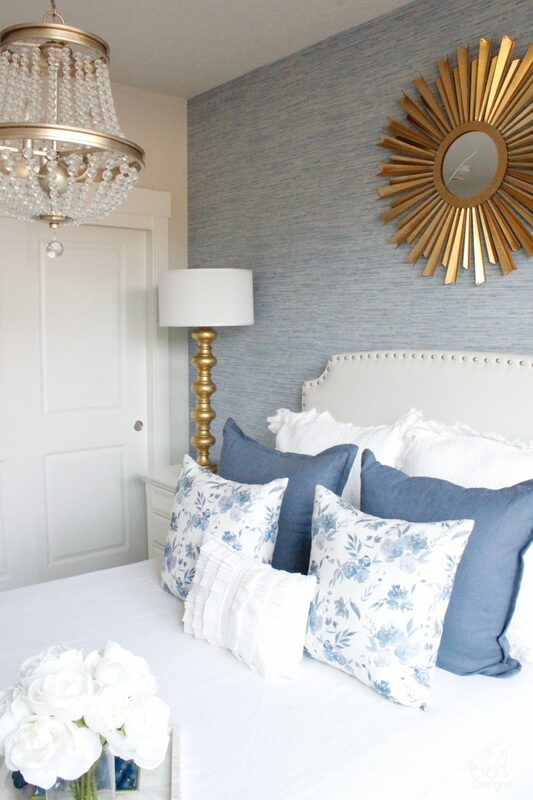 This gorgeous sunburst mirror also came from Perigold, as well as these lovely Caitlin Wilson blue floral pillow covers. As soon as I saw these pillows, I knew they’d be perfect because I wanted a couple of soft feminine touches to this room. All other pillows and the rest of the bedding were from HomeGoods but I’ll have links for them at the end of the post in the “Shop The Post” section . This headboard is the perfect shape for this space and can be found HERE or HERE. 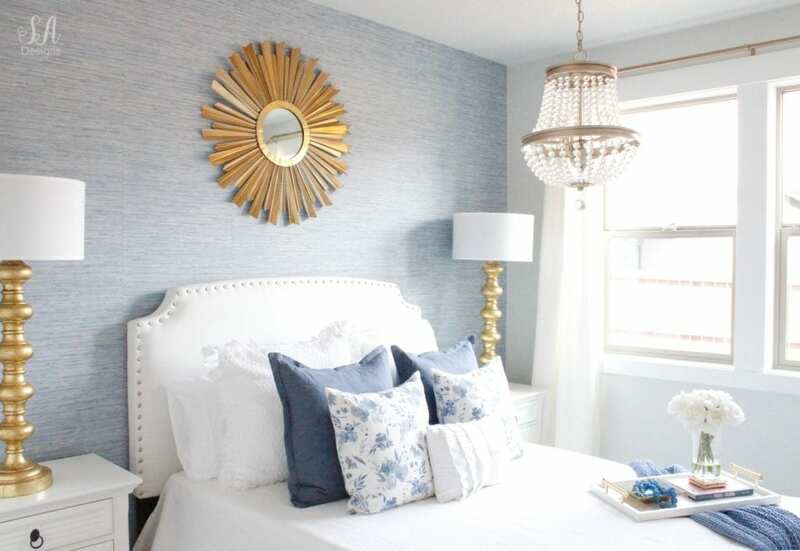 I used this chandelier and another just like it back in our Dallas kitchen and nook and decided that, even though it was a cooler gold, I liked it in the guest bedroom. 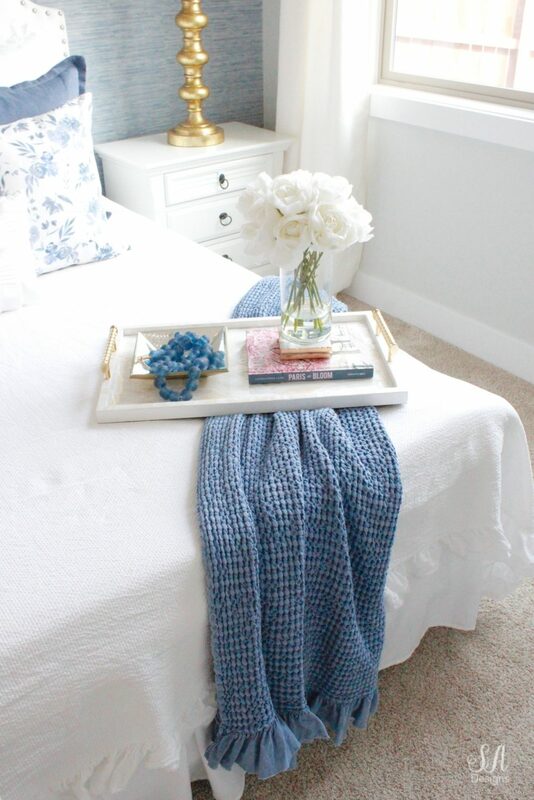 Mother of Pearl tray, faux flowers, and throw blanket all from HomeGoods. 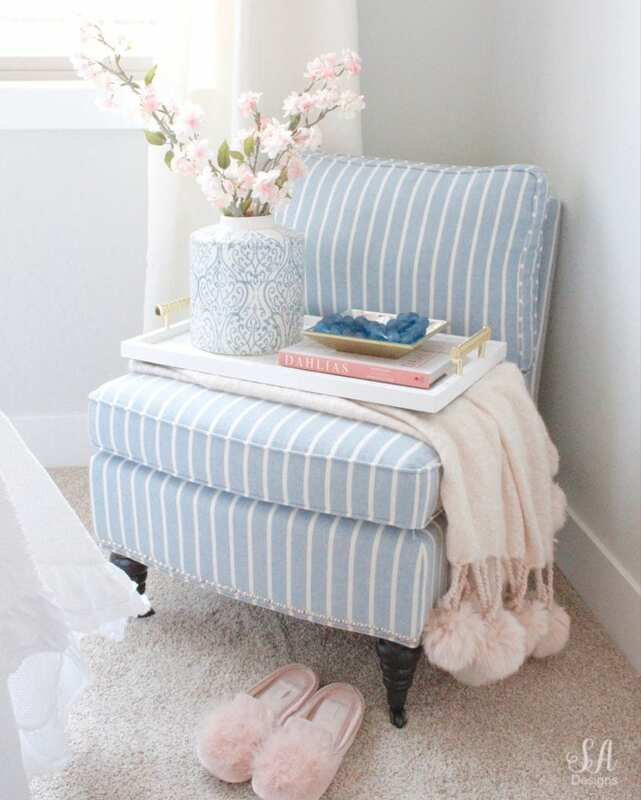 The last thing I wanted for this room was just a small slipper chair to rest any guest’s bags or sit on to take off their shoes…or to sit and read on. I wanted it to be comfortable but smaller and stylish. 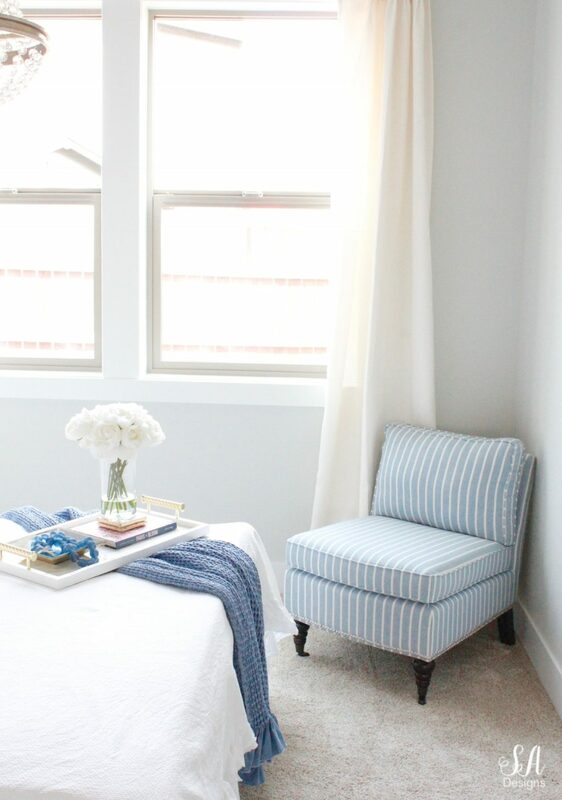 I envisioned something blue and white striped that went with the wallpaper and I found it! The price is fantastic and you can shop it HERE or HERE. This room is going to be fun to change up and add different accent colors to, especially this little chair. It’s so cute when I bring in some pops of blush pink! So fun, right?! The wall to the right of the windows has gorgeous artwork coming that has been backordered so check back soon because I’ll be updating this post when it arrives and sharing photos. 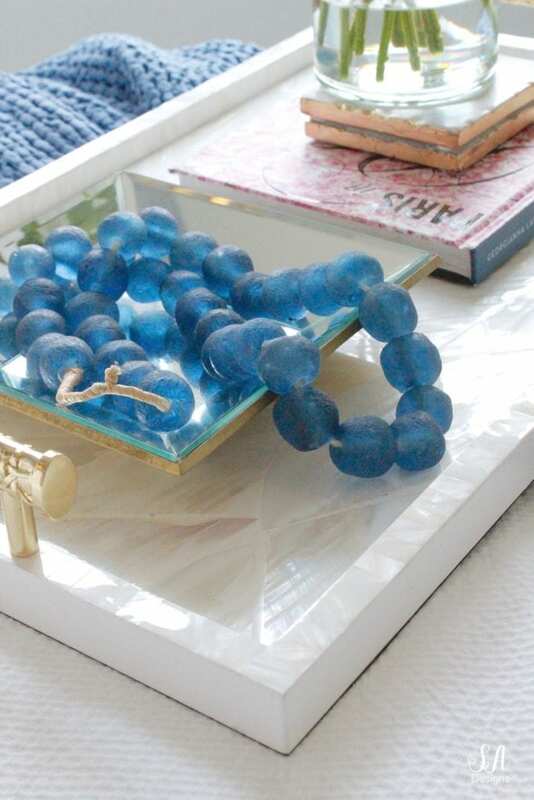 They are gorgeous coastal photos that will be soothing for guests and perfect for this “coastal glam” guest bedroom. 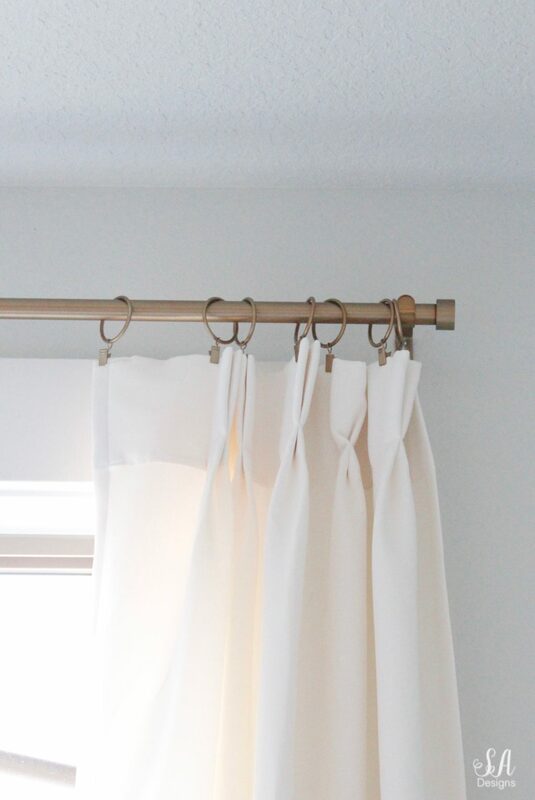 This is the same curtain rod and rings that I used in my office and living room and loved them enough to use them again here. These curtains are the perfect ivory, not too white or too creamy, good quality and fabric, pinch-pleated, and the price is phenomenal. I’m going to hem them but for now, a little puddling looks nice. For wall and trim PAINT COLORS, please see this post. So beautiful Sum! 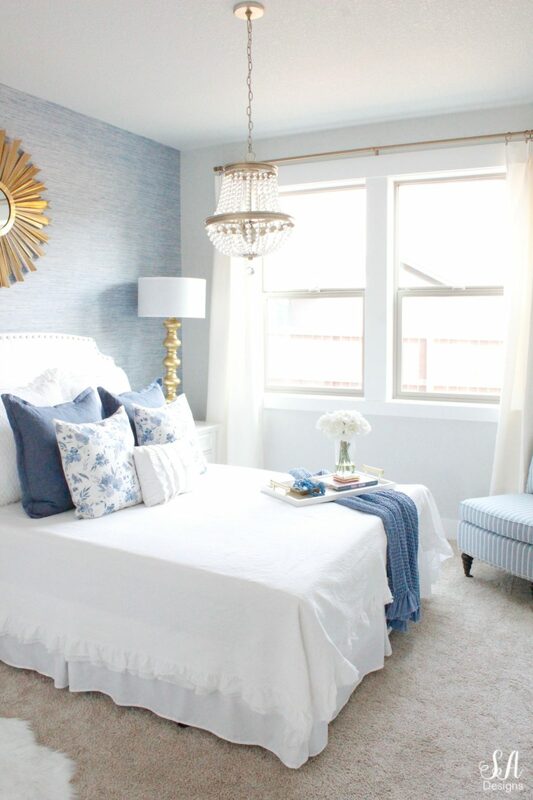 I feel like this is Grandma Crosby’s dream room….updated! haha that’s what Cameron and Grandpa and I were saying!! I am not a wallpaper person… but I luv that blue paper… WoW !! The room is BEAUTIFUL ! !… that shade of blue is PERFECT ! !